The Sumerians of the Fertile Crescent, Mesopotamia are credited with the first use of mathematics. They developed a metrological system, first decimal based and then sexagesimals, 60 based, bequeathing to us the 60 seconds/60 minutes of an hour; 360 degrees in a circle and 3 x 60 or 180 degrees in a triangle. But from the earliest periods of history in Europe, c35000 – 20000BCE, there is evidence of counting systems. Thus by 4000BCE megalithic metrology may have been the norm for our ancestors. Intimations of counting and numeracy in this period come from the many notched bone and stone pieces found by archaeologists. These can be accurately dated. 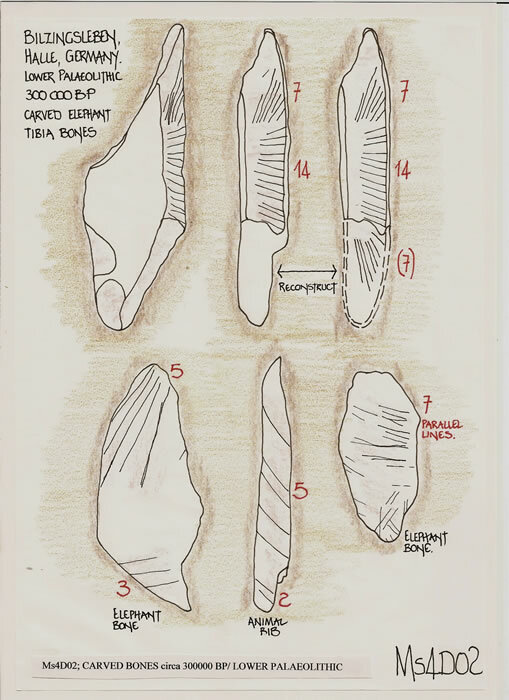 They include a notched bone of the Magdalenian period, 19000-12000BCE, found at Brassempouy, Landes, France, with notches in groups of 3, 5, 7 & 9. This enables counting, the mathematics of addition and subtraction to be carried out. At La Grotte de Remonchamps, Belgium, a small bone with a series of groups of five holes was found in 1902. Then a further excavation in 1970 uncovered another. Both were dated to +10000BCE and were practically the same length at 70 cms. Analysis of these two bones led to the belief that a large and progressive counting system could easily be achieved. But most surprising of all is the discovery made in 1969 at Bilzingleben, (east) Germany. The site variously dated to 250000-300000BCE provided the remains of four bones. Not just any bones but Elephant Bones, deliberately carved with marks of similar depth and made by a single tool in a single operation. The number of notches, a three sequence carving is, 7: 14: 7. The index to this book under Mathematics has, “Mathematics and Numerical Systems”, “Engravings” and “Significant numbers (7 & 14), as numerated headings. It is necessary to search for the oldest evidence of man’s intellectual activities and these will be found in the evidence of the oldest recorded actions. That is the erection of Stones, Stone Circles and similar landscape phenomenon. The power to perceive and imagine is not intellectual activity. Ancient man must have taken actions, produced objects or systems which interact with one another. “By definition a megalith is not a chance phenomenon, but was erected through deliberate human effort. WHY? HOW? Moving such massive objects obviously required a sound understanding of traction, elevation, material resistance, in short an extensive fount of knowledge. The problem lies in assessing how far prehistoric “engineers” and “worshippers” progressed in theoretical understanding”. We are all fully aware of the hundreds of Standing Stones and Stone Circles in the British landscape, but this activity is in fact spread far and wide. It is a Europe and World Wide phenomenon. They exist in Scandinavia, France, Ireland, Eastern Europe, Arabia, N.Africa, Palestine (as was), Sinai, Assam and India. These are the ancient migration routes of man, the agrarian and science distributors. The earliest known writing appeared pre 3200BCE in and around the land of Sumer, between the Tigris and Euphrates rivers. Around 3200BCE they also devised a written numerical notation system, part of which is the sexagesimal, 60 based system. It had previously been an oral system and used the decimal base 10 as an intermediary. However counting systems had been around since at least the 9th millennium BCE, in a Mesolithic and Neolithic Middle East, evinced by the thousands and thousands of ‘Calculi’, which are small objects in a wide variety of sizes and regular geometric shapes. They have been determined by archaeologists as tokens, counting tokens. Following the Sumerians, a Babylonian text dated 1800-1700BCE has the relationship of the three sides of a right angled triangle determined as; A² = B² + C², known to us as the “Pythagorean Theorem”. But his theorem was only established in c530BCE. The earliest known documented record of the PI ratio was written on what is now known as the Rhind Papyrus. This paper implies that the ratio of Circumference to Diameter equals 256/81; i.e. and thus we know, ∏D = Circumference, and ∏R2 = area contained in and of a circle. At the same period the Babylonians were using 25/8 for Pi, and then in the 3rd C. BCE, Archimedes used a 96 sided polygon to establish PI as between 3 10/71 to 3 1/7, i.e. 223/71 to 22/7. Claudius Ptolemy in the 2nd C. CE uses, PI = 30 8’ 30” or 377/120. When we investigate √2, another irrational number which can only be approximated (quite closely though) by a ratio of integers, which can be found quite easily by geometry. A straight edge and compass will enable you to draw a square whose diagonal is x√2 larger than one of the four sides. This third number is the correct value of √2 to four sexagesimal places, which is equivalent to our decimal 1.414213; virtually correct. The second number is the product of the third and first and so gives the length of the diagonal when the side is ‘30’. Note. The original clay tablet is in the Yale University Museum, USA. The Sumerians gave us the 360 degrees of a circle, and thus the 180 degrees of a triangle. After the 45/45/90 degree or 1:1:√2 triangle, the next is the 30/60/90 degree or 1:√3:2 triangle. The fact that the numerical written notation system was derived c3200BCE points to a much earlier discovery which necessitated the above facts being written down as the knowledge increased in complexity. 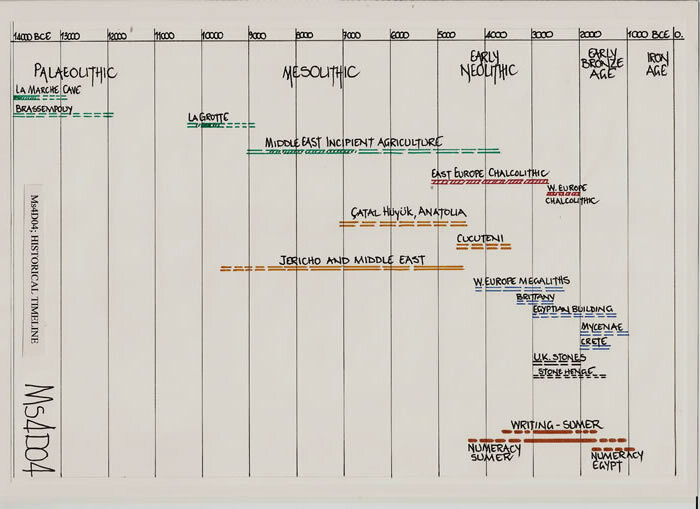 The simplest method to illustrate such a timescale is by a chart diagram. There-on are the pertinent dates here-in discussed, from the Middle East to Britannia. It illustrates that there was a possible time frame for the transference of data from the Sumerian/Babylonian heartlands via Anatolia and the Balkans to Europe. This is also the probable migration route for peoples. When the first farmers encouraged planting and there was a surplus or at least there was no necessity to remain peripatetic hunter-gatherers, the population exploded exponentially. This is evinced by the excavated towns and cities of the Middle East and Anatolia, and even into Romania. As mentioned in Ms3, the Anatolian City of Çatal Hüyük had a population of some 7000 persons and was founded c6000BCE. They constructed a multi-storey city, 14 levels, which required great skill and knowledge. In Romania, the Cucuteni Chalcolithic civilisation is dated in stages ranging from 4500BCE to 3500BCE. Over 300 settlements were discovered in the region, with one near Tal’ianki in the rivers Bug/Dneiper area, covered a surface area of 450 hectares and had some 2700 constructions arranged in two concentric circles. Compare this to the Egyptian development and we see rather unknown civilisations eclipsing all. Thus it is fair to opine that the way was open for transference of ideas and metrological information across southern Europe to Western Europe. We can only assess the likelihood of a measurement being used from the structures that may include the necessity to measure. In paper Ms3 at Sarn Y Bryn Caled in Wales, it was shown that a single measurement was at the heart of the Timber Post Circles design. 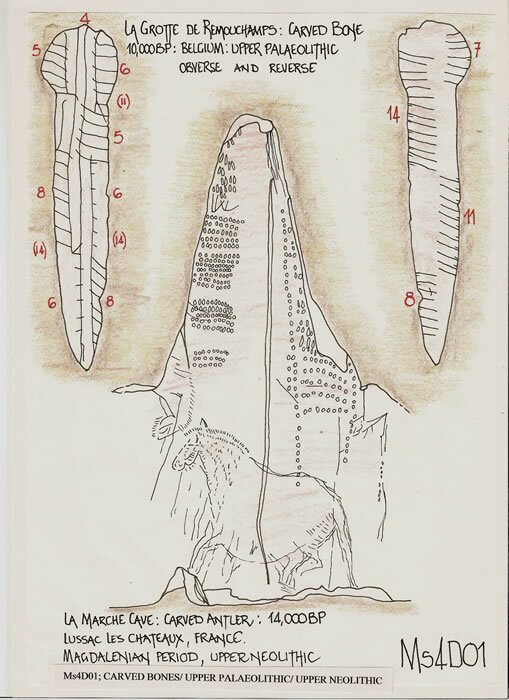 That measurement was 33/7 statute feet, 4.714 feet, 56.5714 inches and that it was linked to the Megalithic Yard, 2.722 feet and the Megalithic Fathom, 5.444 feet determined by Professor Alexander Thom from his survey work on the megalithic sites. I have named the 33/7 unit the Unit Yard, which is a quantum found in Britain and Scandinavia. But can it be shown to have an ancestry in the Middle East or there-about. The information concerning ancient measurements was collated in the 19th century by scholars practising Cambistry, the science of exchange, weights and measures &c.
“Mesure de longueur des anciens, formant la 10e partie du Plèthre. C’etait leur perche d’arpentage. En Egypte, L’acène philétérienne vailat 12/3 Orgyce philétérienne = 5 coudées de 2 pieds = 62/3 coudées philétériennes = 10 pieds philét. = 40 palmes ou palestes = 160 dactyles = 3.937 statute yards. A simple investigation of this measure provides a clue to the origins of megalithic measures. Acène = 3.937 yards or 11.811 feet or 141.732 inches. Thus each dactyle or finger is 141.732 ÷ 160 which equals 0.885825 inches or 22.5mm per unit. Divide the Acène of 11.811 feet by 4.714 feet or the inch measures 141.732 ÷ 56.5714 and we have 2.5054 units. Therefore we can safely assume the Acène was 2.5 unit yards. But if we divide 160 by 2.5 the resultant is 64, and the finger or dactyle becomes 56.5714 ÷ 64, which equals 0.88393 compared to 0.885825. This is a difference of 20 thousandths of an inch! In Babylonia the irrational number √2 was determined and the proof is the clay tablet. However it was calculated using sexagesimals and when translated into a fraction or ratio number becomes 99/70. The comparison is 1.414285714 to 1.414213562, and as such 99/70 is a highly accurate substitute being the square root of 2.0002041. It is easily confirmed by geometry. Draw a 45 degree equilateral triangle with side lengths 70 units. Project the hypotenuse line to the extended base line and the answer can be read, 99 units with a virtually impossible error readable. But, extend that triangle and the next irrational number appears √3, decimally 1.73205081. Further extensions of the triangle indicate and then allow the other irrational numbers to be evaluated. But, if we commence with the 45 degree triangle with side length 40 units, the √2 figure becomes 56.5685 units, which divided by 12 produces a unit of 4.714 or 33/7 units. 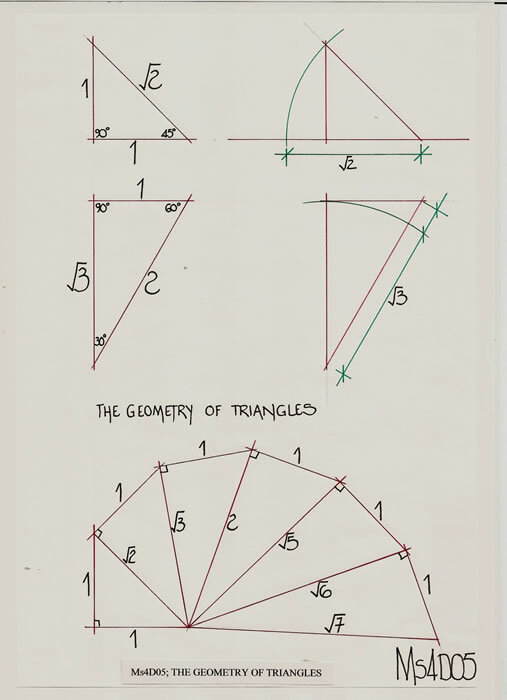 If we now draw a triangle having 30/60/90 degree angles and use the plain 56 as the base measure, the sides are in the ratio 1:√3:2 and the √3 side is measured as 97 units and thus it is possible to use the ratio of 97:56 as a representation of √3. √ [(112 x 112) – (56 x 56)] = √3. That is, 12544 – 3136 = 9408, the calculated square root of which is 96.9948, and the original 97 x 97 equals 9409. This would have been an infinitesimal difference when a triangle was drawn on parchment or similar. But, in trying to increase the accuracy, draw the triangle as 56.5/113 units and √3 becomes 97.861 units, or decimally 1.732053097, still remarkably accurate. However, increase the unit to 98/56.5 and the figure is 1.7345 which is increasingly in-accurate. In the mathematical mind there would have been the thought that irrational numbers may have a common base, and the number 7 may provide an answer. It is plausible to consider that √3 may well have been 343/198 which is quite clearly a 7 base number. Fractions equal; (7 x 7 x 7 x 7)/(7 x 20 x √2) or (7 x 7 x 7 x 70)/(20×99) and thus as √2 = 99/70 and can be written as 3/10 x 33/7. There is the direct link mathematically to the unit yard ratio. Decimally it is 1.732323232 which when squared equals 3.000944, and is quite therefore accurate. Thus Megalithic measures, the Yard, Fathom and Unit Yard which have their relationship determined by the 1:√3:2 ratio triangle may also arise from a far simpler metrology the human body. Did Mesolithic or Neolithic man originate measures by using the most basic of all instruments, the human hand? 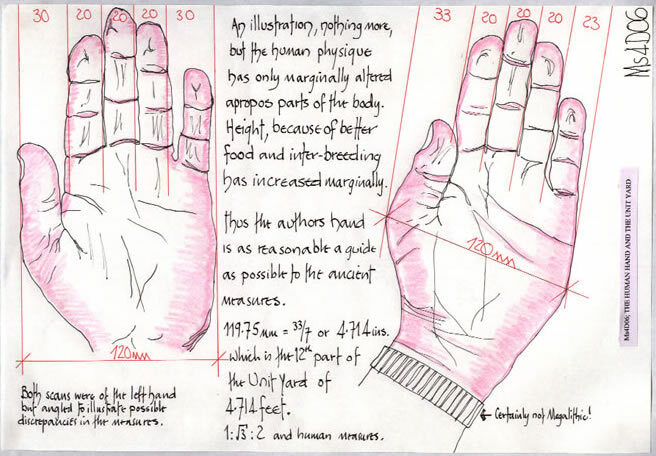 In Ms3, it was stated that this authors hand was c120mm and that the twelfth part of the Megalithic Unit Yard was 119.75mm. That hands index finger is c20mm and the sixth part of 119.75 equals 19.958mm. Thus the Unit Yard may have had 72 base units. And thus 49/9 x 49/9 = (49/18 x 49/18) + (33/7 x 33/7). But, X² = 200/9 or therefore X² = (10√2 ÷3) x (10√2 ÷3), and thus X = 10√2 ÷3. Finally √2 = 99/70 and therefore we have (10 x 99) ÷ (3 x 70) or 33/7. Substitute a measurement for the unit number and there is a coherent system for megalithic man to have used, the Unit Yard. Consider this. What has just been shown is that the irrational numbers PI, √2 and √3, as well as a ratio measure used in metrology all have the same base. Pi = 22/7: √2 = 99/70: √3 = 343/198 and the Unit yard is a ratio 33/7 units. They are all capable of being expressed as a factor of each other. They are therefore inter-changeable in a mathematical equation, and without a pocket calculator handy, substitution is the only practical method of solving some equations. If you are inventing a system of mathematics, that would surely be a pre-requisite. Mathematics and measurement were developed in the Middle East, basically Mesopotamia and spread both Westerly and Easterly across the continents. There they developed a highly sophisticated sexagesimal system from an original decimal additive system. They developed answers to the irrational numbers in the form of fractions or ratios. There was then a trend westwards by an expanding populace who met other sophisticated civilisations and gradually the mathematical as well as the agrarian principles were transmitted and thus transported across the continents. The less sophisticated, although equally intelligent peoples of the far west of Europe learnt the basic geometry and applied it to their monuments in the form of shape and measure. Thus we find in the landscape of Western Europe a quantum measure which is part of the Middle East metrology. I have not actively sought out a measurement attributable to Megalithic man. My reading matter over many years has been quite eclectic and I have gradually evaluated the data there-in and then found that this research was so very necessary. However, when I started seeking actual examples of ancient mans mathematical and geometric knowledge the following text was a cautionary tale, but also a spur to do better. That caution is only realistic if you do not acknowledge the original methods that would have been utilised by ancient man and endeavour to work in a similar manner. Thus everything, every number must be a fraction, a ratio and the calculator should be banned. Given that Archaeologists did not recognize that measurement was part of their remit it is no surprise that they did not recognize when to use mathematics. 1. Armenia and Asia Minor in antiquity. La mille etait 7 grandes asparez = 10 asparez ordinaire = 1000 pas = 6000 pieds phileteriens Asparez, 7e part du mille, etait egal a 13/7 asparez ordinaire 1426/7 pas = 8571/7 pieds phileteriens = 337.462 statute yards. The Miele is 4.714 statute miles. That is 4.714 inches x 63360; 4.714 feet x 5280 and 4.714 x 1760 yards. The Austrian system is in fact now, 288000 Zoll, 24000 Fuss and 4000 Klafter equal the Miele. But there is also the remnant of earlier measures in the 33 inch unit that exists. And that unit is of course 7 x 4.714 inches or 7 x 33/7 inches. 3. The Basque League and Terrestrial Geometry Papers published in Archaeoastronomy discuss the origins of the Iberian Vara unit and its utilisation in the construction of Stone circles in the Basque country and northern Spain. The base 7 mathematical system and the Vara standard used by the Basques in laying out circles also appear to have been employed by them to determine the circumference of the earth. 1. 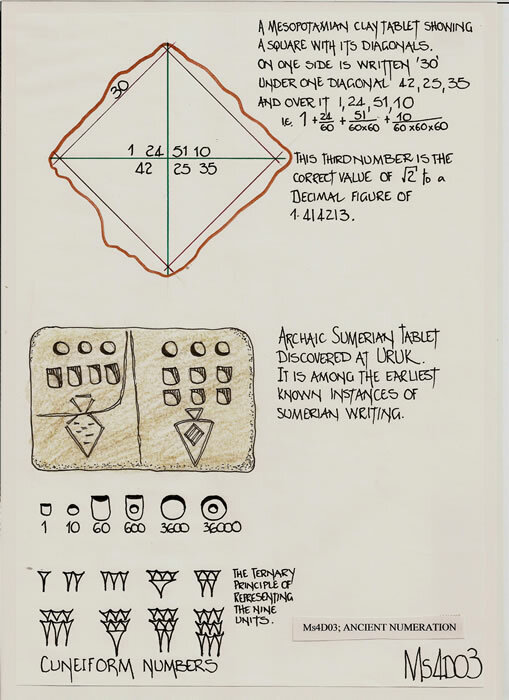 IFRAH, Georges, 1998, ‘The Universal History of Numbers from Prehistory to the invention of the Computer.’ The Harvill Press London. 2. RUDGELEY Richard, 1998, ‘Lost Civilisations of the Stone Age’, Century Publishing London. 3. CUCUTENI; The Last Great Chalcolithic Civilisation in Europe. Historical texts and exhibition catalogue by The Archaeological Museum of Thessaloniki, 1997. 4. BLATNER David, 1997, ‘The Joy of PI’, Penguin Books London. 5. DOURSTHER Horace, 1840, ‘Dictionnaire Universel des poids et mesures anciens contenat des tables des monnaies de tous pays.’ Brussels: M Hayez, Imprimeur de L’Academie Royale. 6. HOLLINGDALE Stuart, 1991, ‘Makers of Mathematics’, Penguin Books London. 7. FRANK Roslyn M, 1982, ‘Basque Stone Circles and Geometry’, Archaeoastronomy Vol iii, No1 pp28-33 and, ‘The Basque League and Terrestrial Geometry’, Archaeoastronomy Vol V(1) pp24-29. 8. THOM Alexander, 1967, ‘Megalithic Sites in Britain, Clarendon Press, Oxford. He was Professor and Chair of Engineering Science, Oxford University. 9. THOM Archibold S, 1995, ‘Walking in all of the Squares’, Argyll Publishing. This book is a tribute to his father, Alexander Thom whom he assisted in many of the surveys and research projects. It contains a wealth of information in the form of essays by many learned academics on the subject of Megaliths, their position in the landscape, their astronomical significance and of course the measurements utilised.